I’m always looking for new ways to lighten up meals without sacrificing on flavor. One of my favorite go-to meals is my lightened version of spaghetti and meatballs. I swap the noodles with spaghetti squash, allowing me to enjoy the great flavor of spaghetti without eating a heavy meal. Lately, I started swapping out tortilla shells and replacing them with greens, such as butter leaf lettuce, iceberg lettuce, or collard greens. I’ve enjoyed lettuce wrapped tacos and sandwiches with lettuce wraps (I love the Jimmy John’s unwich!) and I’ve been looking to expand my repertoire. 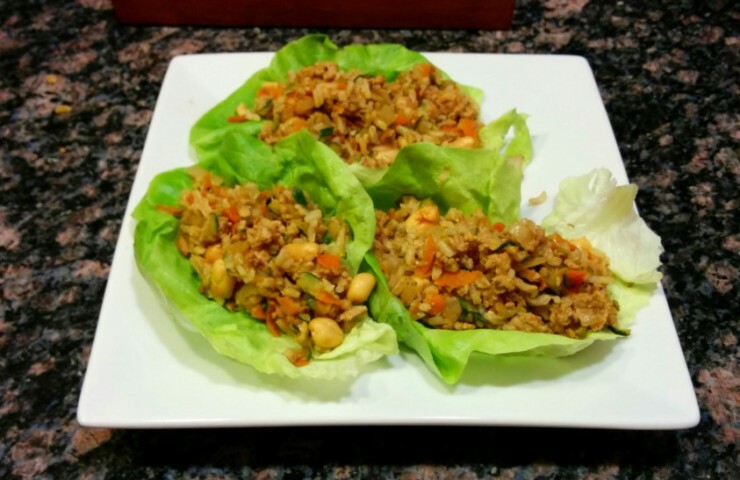 I’ve experimented with Asian-style wraps before, so I decided to swap out tortillas and use butter leaf lettuce in this recipe. I was even more enthusiastic about this recipe because I could add one of my recent obsessions: sesame oil. I love how flavorful it is, not to mention it smells incredible when cooking! I also decided to include cumin in this recipe because it is by far my favorite spice as of late; I’ve been adding it to just about everything I can. Yum! 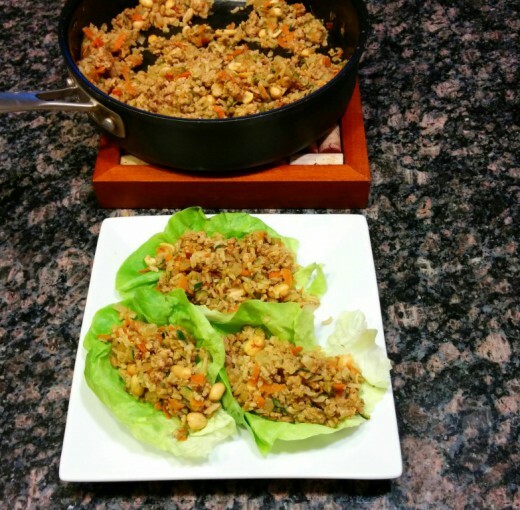 The meat mixture for the lettuce wraps can be made in advance and stored in the refrigerator for up to a week. I recently visited my family in Minnesota for a long weekend, so I made the mixture up for my husband to have for quick meals after work. Begin by browning 1/2 pound of ground turkey with 1/2 of a diced onion in a large skillet. Add in a small shredded zucchini, a small shredded carrot, and 1/2 cup of cooked brown rice. Add sesame oil, 1/2 packet of lettuce wrap seasoning (I found this in the ethnic foods aisle of my local grocery store), soy sauce, cumin, and garlic powder. Season with salt and pepper and gently mix. Add in 1/4 cup of peanuts, if desired. Wash and thoroughly dry the lettuce leaves. I used butter leaf lettuce here, but as I mentioned, collard greens or iceberg lettuce will work well too. 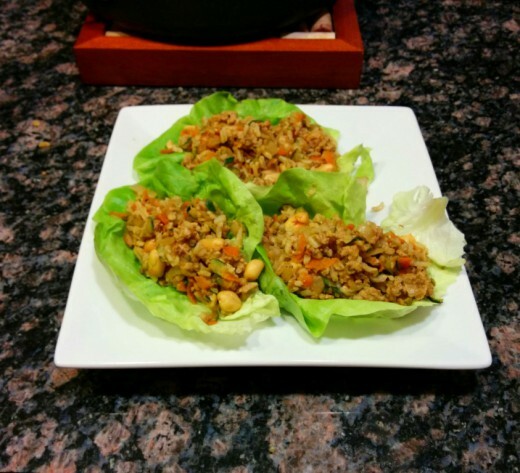 Carefully spoon the meat mixture into the lettuce leaves and serve immediately! 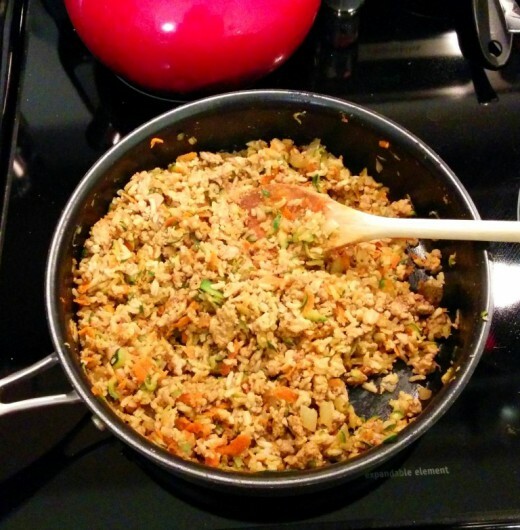 Brown ground turkey with diced onion in a large skillet. Add in shredded zucchini, shredded carrot, and cooked brown rice. Add sesame oil, lettuce wrap seasoning, soy sauce, cumin, and garlic powder. Season with salt and pepper. Mix well. Add in peanuts, if desired. Spoon mixture into lettuce leaves and serve immediately!